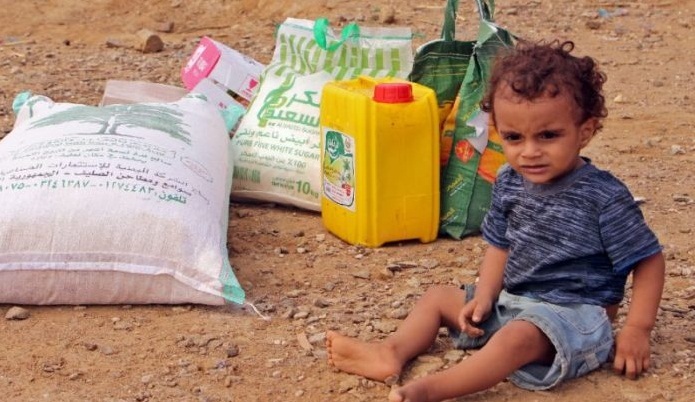 Saudi Arabia and the UAE, which lead a military coalition against the Huthi rebels in Yemen, announced Tuesday $500 million in aid to the country on the brink of famine. Saudi Arabia and the United Arab Emirates will each give $250 million in response to the food crisis to support more than 10 million people, said Abdullah Rabeeah, general supervisor at King Salman Humanitarian Aid and Relief Centre. He added that donations will go through the United Nations as well as other international and local aid groups. Rabeeah spoke at a joint news conference in Riyadh with UAE Minister of State for International Cooperation Reem al-Hashimy. The latest aid package comes after the two countries and Kuwait offered $1.25 billion to the UN’s humanitarian response plan in Yemen for 2018, according to Rabeeah. Saudi Arabia and the UAE intervened in the Yemen war in 2015 to bolster Yemeni President Abedrabbo Mansour Hadi after the Huthis took over the capital Sanaa. Both the military coalition backing the government and the Huthi rebels stand accused of acts that could amount to war crimes. The World Health Organization says nearly 10,000 people have been killed in Yemen since the coalition intervention in March 2015, but rights groups believe the toll may be five times higher. The war in Yemen — already one of the world’s most impoverished countries — has left the nation on the edge of mass starvation in what the UN calls the worst humanitarian crisis. The UN is already providing food aid to some eight million Yemenis but that number could reach 14 million next year, UN Secretary General Antonio Guterres warned last week.